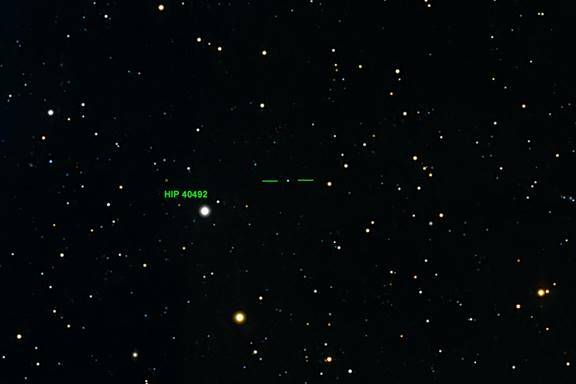 I took images of this region on 12 Dec 2017 searching for HIP 40492 (HD 68790) which is listed in SIMBAD as a high proper motion star. However, comparing the frame to DSS2 images on Aladin, I could find no prominent shift in the position of the star at this scale. This chemically primitive dwarf star, whose full identifier is SDSS J081554.26+472947.5, is located in the halo of the Milky Way at the distance of 7,500 LY (2,300 PC) from Earth, and 33,000 LY from the galactic center. The star is estimated to have 70% of the solar mass, and surface temperature of 6215 K. SIMBAD lists its (J2000) coordinates as 08h 15m 54.268s +47d 29' 47.573'', and its green apparent magnitude as 17.1. According to Stellarium, the apparent magnitude is 16.4, B-V 0.29. SDSS7 lists the apparent magnitude as 16.6. This compares well with the Sun's absolute magnitude of 4.83, and gives an idea of how our Sun would appear at the same distance, albeit more yellowish. Based on spectroscopic features indicating ultra-low metallicity, the star is estimated to have formed 13.5 billion years ago, only 300 million years after the Big Bang. Metallicity, denoted by Z, is the proportion of elements heavier than Hydrogen (H) and Helium (He) contained in a star's radiative surface. Deep regions of stars are not accessible to spectroscopic analysis. In astrophysics, all elements heavier than Helium are regarded as "metals", although they might not be metals in the chemical sense. As stars age, the proportion of metals in their cores increases due to nuclear fusion of Hydrogen and Helium into heavier elements. But, with some exceptions, metallicity of a star's surface does not change as the star ages because core material does not mix with the visible surface of the star, and there is no appreciable nuclear processing in the outer gaseous envelope. Generally speaking, the stellar surface preserves the information on the abundance of elements which were present in the interstellar gas and dust from which the star initially formed. Following the Big Bang, primordial gas clouds contained mainly Hydrogen, some Helium, and only trace amounts of Lithium and Beryllium. As the stars formed, and the universe aged, the interstellar medium was infused with heavier elements, including Iron, predominantly by supernova explosions, but also by massive Wolf-Rayet (WR) stars which do manifest core to surface mixing and surface mass loss due to radiation pressure from extreme temperatures. The latest thinking is that elements heavier than Iron are formed primarily in neutron star collisions. Stars with surfaces of low metallicity are presumed to be very old, and to have arisen in the early universe before too many previous generations of supernovae enriched the interstellar medium. Such stars, typically found in globular clusters and galactic halos, are classified as population II stars. Younger stars formed from "metal" rich dust clouds, the Sun among them, are classified as population I stars, and are generally found in galactic disks. Recently, population III has been proposed to include the very first generation of stars after the Big Bang, composed purely of Hydrogen and Helium. Such stars would have metallicity approaching zero, and so far no such star has been identified. However, the oldest star known, J0815+4729, comes close. Metallicity is the fraction of a star's mass which is neither Hydrogen nor Helium. Since only the star's radiative surface is available for spectroscopic analysis, measures of stellar metallicity usually imply surface metallicity. Metallicity of stellar interiors, which have been altered by nuclear fusion, can not be measured directly, but can be roughly estimated by theoretical models and by comparison with the Sun. As the nearest star, the Sun is amenable to studies in addition to spectroscopy. solar wind analysis, helioseizmological measurements, and theoretical models suggest that the lower limit for metallicity of the Sun's interior is 0.02, which means that about 2% of the elements in the Sun's interior are "metals". In comparison, latest estimates for the Sun's surface metallicity is about 0.013, or 1.3%. The determination of total metallicity, including all elements, in the stellar spectrum is very complex, and requires large telescopes with high resolution spectrographs. Instead, the abundance of a single spectroscopically prominent "metal", usually Iron, Oxygen, Carbon, or Calcium, is measured relative to Hydrogen, and the result is compared to that of the Sun or to a theoretical model. The most easily and commonly measured ratio is Iron (Fe) to Hydrogen (H): [Fe/H]. where Asv represents a star's Fe/H surface abundance compared to the Sun's, and Asun is always equal to 1. For a star with Fe/H abundance identical to the Sun's: Asv = log (1/1) = 0. Stars with Fe/H abundance higher than the Sun's have positive Asv values, while stars with lower Fe/H abundance have negative Asv values. First generation, (population III) stars would have only trace metals in their spectrum, Astar would approach zero, and Asv would approach negative infinity. In terms of Iron (Fe) to Hydrogen (H) abundance ratio, star J0815+4729 has a very low Asv value of -5.8. This means that the interstellar medium in which this ancient star was born had about 631,000 times less Iron abundance than the Sun. In terms of Carbon [C] to Iron [Fe] abundance ratio, [C/Fe], J0815+4729 was found to have the Asv value of +5, indicating that its abundance of Carbon relative to Iron is 100,000 times higher than the same ratio in the Sun. Note that the star still has some 6.3 times less Carbon abundance than the Sun. J0815+4729 is the oldest star so far detected, but the evidence of "metals", even in small concentrations, indicates the presence in the very early universe of mechanisms which enriched the interstellar medium. Due to low incidence and relatively low total yields, Wolf-Rayet stars and neutron star collisions are thought to have contributed relatively little. The main agents of enrichment are thought to have been supernovae, and the high [C/Fe] abundance ratio in J0815+4729 is an indicator of the supernova type prevalent in the early universe. Supernova explosions represent last stages of stellar evolution in a select group of stars whereby the stars eject much or all of their material into interstellar space. The process is so energetic that for a brief time a supernova may outshine the entire galaxy. One result is enrichment of the interstellar medium with heavy elements or "metals". Another is the formation of new stars within the compressed densities in surrounding gas clouds caused by the expanding shock waves of expelled materials. Supernovae (SNe plural, SN singular) are categorized into various classes and subclasses according to the maximum absolute magnitude, the shape of the light curve, and spectroscopic characteristics. For our purpose we will consider only two general types: type Ia and type II. Type Ia, called nuclear fusion reignition, or thermal runaway supernova, develops in a gravitationally bound pair of small to medium stars in which the smaller star ran out of nuclear fuel and became a white dwarf, while the larger star is still fusing Helium as a red giant. In a sufficiently tight orbit, the white dwarf may begin to accumulate mass from its companion through accretion. As the mass of the white dwarf increases to 1.44 solar masses (Chandrasekhar limit), pressure and temperature in the core become sufficiently high to suddenly reignite nuclear fusion. This results in an explosion which often disintegrates the entire star, and disperses "metals" into interstellar space including freshly fused Iron. SNe Ia absolute magnitude at maximum luminosity is consistently -19.3, and they are used as standard "candles" in the measurement of intergalactic distances and expansion rates of the universe. Type II, called core-collapse supernovae, originate from short-lived supergiant and Wolf-Rayet stars larger than approximately 8 solar masses. As these stars age, they develop onion layers of progressively heavier elements toward the interior, with Iron in the core. Stars do not fuse heavier elements because Iron fusion uses more energy than it can release. When the Iron core reaches the Chandrasekhar limit of 1.44 solar masses, the core collapses upon itself compressing electrons into protons to form neutrons and an outburst of neutrinos. The outer layers of the star rapidly fall in, then rebound causing an outward shock wave. Neutrino outburst and the rebound shock wave combine to blow apart the star's outer layers which contain ligher elements including Carbon and Oxygen. Depending on mass and metallicity, the collapsed Iron core remains behind as a neutron star or a black hole. Note that Type Ia nuclear fusion supernova explosion disintegrates the entire star, expelling into space the outer layers as well as the freshly fused Iron-rich core, resulting in high Iron (Fe) abundance. Therefore, these ejecta have high [Fe/H] and low [C/Fe] abundance ratios NOT consistent with the abundance ratios in our ancient star. Furthermore, small stars with lower internal pressures fuse elements slowly, and have long life cycles before reaching the white dwarf stage - on the order of billions of years. It appears impossible that Type Ia supernovas contributed to the metallicity of the very early universe. In Type II core-collapse supernovae the outer shell with lighter elements, including Carbon, is expelled into space, while most of the Iron-rich core is captured in the residual neutron star or a black hole. As the result, these ejecta have low [Fe/H] and high [C/Fe] abundance ratios consistent with the findings in the ancient star. The theory that core-collapse SNe were responsible for dispersing metals in the very early universe is supported by the fact that massive stars which are their progenitors have only brief lifespans - as short as several million years. The objective of the search for ancient stars is to derive from their metallicity theoretical size and elemental yield estimates of the primordial core-collapse supernovae which had formed in the zero-metal environment of the early universe. Elemental abundance influences many physical properties of a star. For two stars of the same mass and age, the one with lower metallicity tends to have a higher temperature, bluer color, lower B-V index, and is less likely to form both gas giant and rocky planets. Supergiant stars of low metallicity are more likely to form black holes rather than neutron stars as their core-collapse remnants. Thanks for your interesting post and the link to the paper by the Spanish astronomers. Several months ago I happened to find in my public library a book by astronomer Anna Frebel:Searching For The Oldest Stars-Ancient Relics From The Early Universe- which I found to be interesting and informative. It is not a professional paper but puts this area of astrophysics into an informative perspective. I will go back and reread this book. She is noted in the bibliography of the paper in your link. 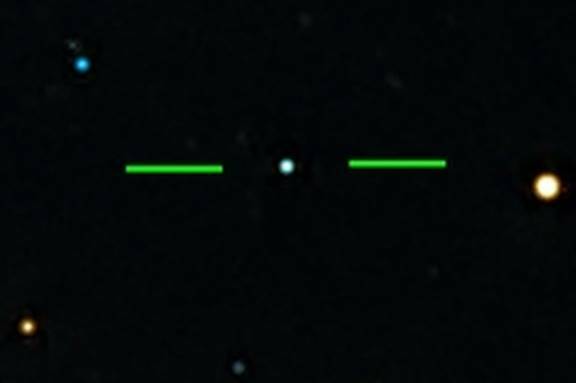 I may try and get an image of J0815+4729. Great to see articles like this instead of equipment reviews...we need more! Very interesting and thanks !! Good article. Back in the day I did some spectroscopy of low metallicity halo population stars. HD 68790 looks from the Gaia data to have about 45mas proper motion in declination per year, so over 50 years that's about 2 arc seconds which is easily measured in a tool like astrometrica on an amateur image but I think it would be hard to just see that visually. Astrometrica draws these little sticks on the reference stars it has to show proper motion. Excellent article. This is a very nice addition to the CN library. I'm having a difficult time trying to understand what your point is. It's great that you've extracted lots of information from various sources, but I don't know that that there is much new here. So SIMBAD my have an incorrect proper motion for the subject star. SIMBAD, like any large database, will have many errors. What I would hope for is an abstract, as in a professional journal, where one sums up what is new/interesting about the text that follows. I think this article would have been much better if it had just gotten to the point. A paper (I think this was published in 2014) by Anna Frebel and others discusses a similar highly metal poor (HMP) star and its theoretical origin. S. C. Keller, M. S. Bessell, A. Frebel*, A. R. Casey, M. Asplund, H. R. Jacobson∗, K.
Lind, J. E. Norris, D. Yong, A. Heger, Z. Magic, G. S. Da Costa, B. P. Schmidt, & P.
To me it is remarkable that we have found these individual relics of the early universe (these are perhaps 2nd generation stars) only a few thousand light years from our solar system. Very interesting and important article on the oldest known star, expanded into a paper on the history of our galaxy, stellar classification, spectrum types, the life, death, and rebirth of stars, and the elements of which stars are made. Excellent. Boom goes the dynamite, excellent! Thanks for sharing this intersting information with our community!